Working with Joyce is so much fun. Her creativity and years of experience facilitated the crafting of some amazing products for Bi-Rite. My favorite project with Joyce was the production of quince paste specifically for us. She was so excited to collaborate with our farmer network to turn quince, often from single trees, into the most exquisite membrillo. Joyce is skilled, passionate and a great communicator, a pure joy to work with. It has been my absolute honor and pleasure to work with Joyce on several projects. Whether it be a wonderful Passover Seder inspired by her book (Perbacco) or a complete menu consulting project (Porta Blu at the Hotel Nia), Joyce is our go to chef. Her knowledge candor and experience always lead to an outcome that makes perfect and delicious sense for our projects. She is a prolific chef and now I am also lucky enough to call her a friend as well. She is a remarkable lady with the best taste in the business. I have had the privilege, pleasure and honor to work with Joyce Goldstein, without a doubt one of the highest authority in Mediterranean Cuisine if not the highest. She has pioneered the flavors and culture of these countries, introducing tapas and mezzas in San Francisco’s cuisine and gastronomy’s avant garde. Working with her at the Greystone Restaurant at the CIA allowed me a glimpse of her vast repertoire. Her immense knowledge coupled with her tremendous ability to develop applications, relevant for various occasions, is what drove me to reach out and ask her for help. 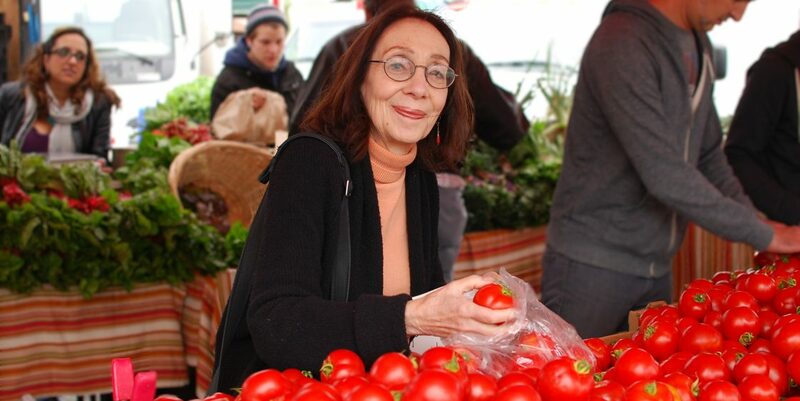 It was Joyce’s guidance that helped us to develop plant-centric concepts and menus at Yale University back in 2009. Transformation of the salad bar, intense utilization of legumes, grains and olive oil in the most seductive way, teaching taste, appreciating wine and food in a complementary approach, flavor intensity and ingredient quality and specifications are among courses and teachings that students and Yale Hospitality employees become enriched by. We love and cherish every opportunity we get to work with her. “It was really an honor and a lot of fun to work with Joyce. Since she was the original consulting chef when the restaurant first opened in 1997, it was great to be able to refer to her for much of the original ideas and recipes. From there, we worked on menu items that could tell a story, but stick to its origins and also make sure it tasted great. 1997 Consultant- Breadline – Washington D.C.
1996 – 2000 Consultant – Spazzo Mediterranean Grill – Seattle- Schwartz Bros.